Even though it’s technically still spring, it feels like summer. I’m down in Texas for the time being, and whew it’s humid! In the spirit of spring cleaning I went through some of my old architecture stuff … and I can’t believe I actually kept some of this stuff. After living in a fairly small Manhattan apartment, I’m beginning to see how useless this extra stuff is. About three years ago I was in an experimental organic architecture studio, where what we ended up creating were less like buildings and more like art pieces. It was fairly complicated, but basically I extrapolated dimensions from Georgia O’Keefe’s “Jack-in-the-Pulpit No. V” painting and for part of the project, I laser cut A LOT OF CIRCLES based on the relationships between those measurements, with the largest circles about 3 inches in diameter. Yeah, it was weird. I used some of the circles, but ended up with a ton of extras. 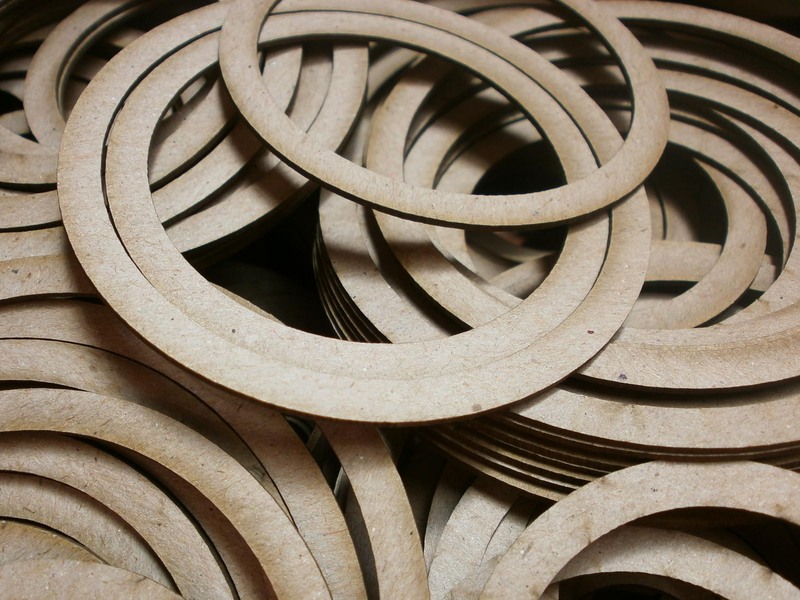 Most were laser cut from cheap 2-ply chipboard. 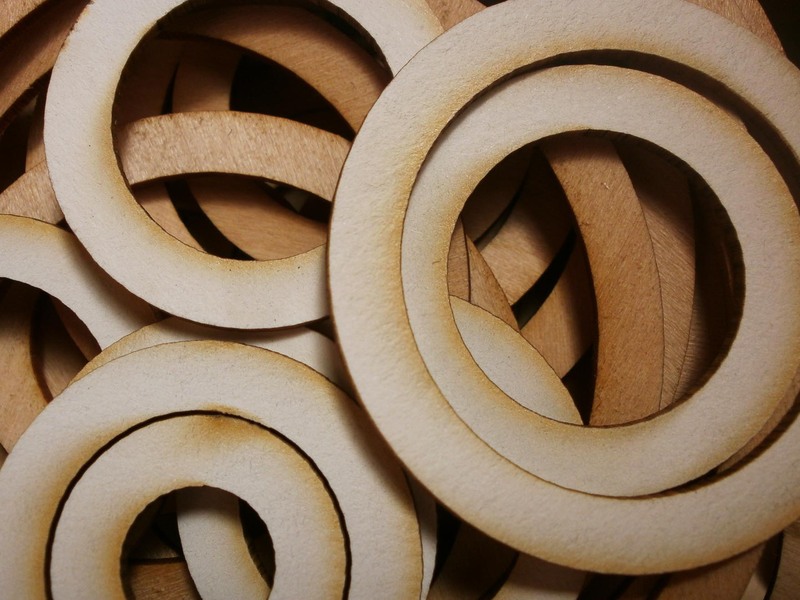 There were also a ton of circles laser cut out of 1/16-inch basswood sheets. And even more cut out of 2-ply white matboard. Um … I think I got a little crazy with the laser cutter, but it’s an awesome piece of machinery! At my graduate school, students aren’t allowed to operate the laser cutter themselves, but back at my undergraduate school, it was free reign (after paying and scheduling the time, of course)! Sigh … I miss the smell of burnt chipboard/basswood/matboard. I didn’t use any of the matboard because the charring was too severe so the circles didn’t turn out as nice and white as I was hoping, but oh well. Good times. Good memories. One of these days I’ll have to post the completed projects, which I was pretty proud of. But after three years, I think I can let go of the 200+ circles. Off to the trash they go! I have left New York for the summer, and I must say … it’s weird. It’s weird because I don’t walk. It’s weird because I have to drive everywhere. It’s weird because it’s so quiet. It’s weird because everything is SO SLOW. Sigh. While I do appreciate the relaxing pace here and the fact that every interior space is air conditioned, it’s a change. I think I definitely prefer city life. I still have some pictures from New York that I’ve been meaning to blog about, so here are a few from the end of April. One of the things I miss about New York is all the art. 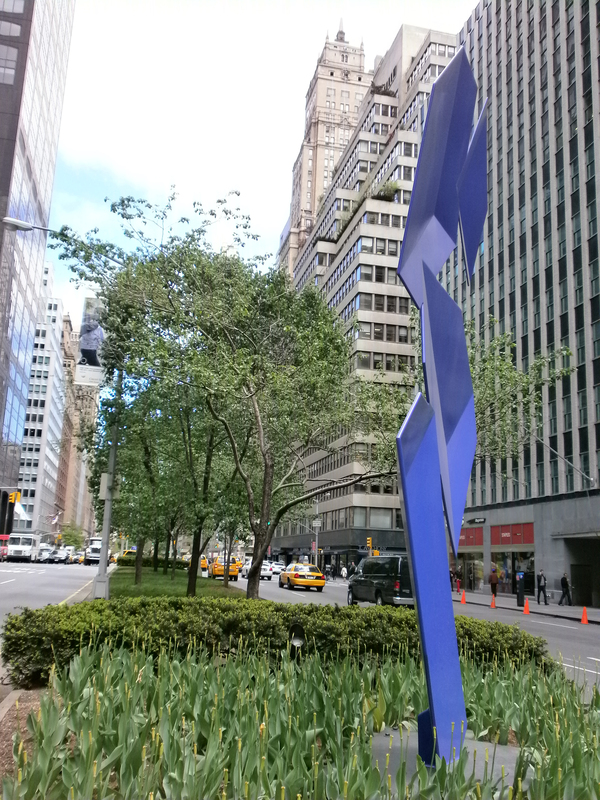 For example, on Park Avenue (I think they’ll be there until June) there were sculptures by Rafael Barrios … and they were awesome! 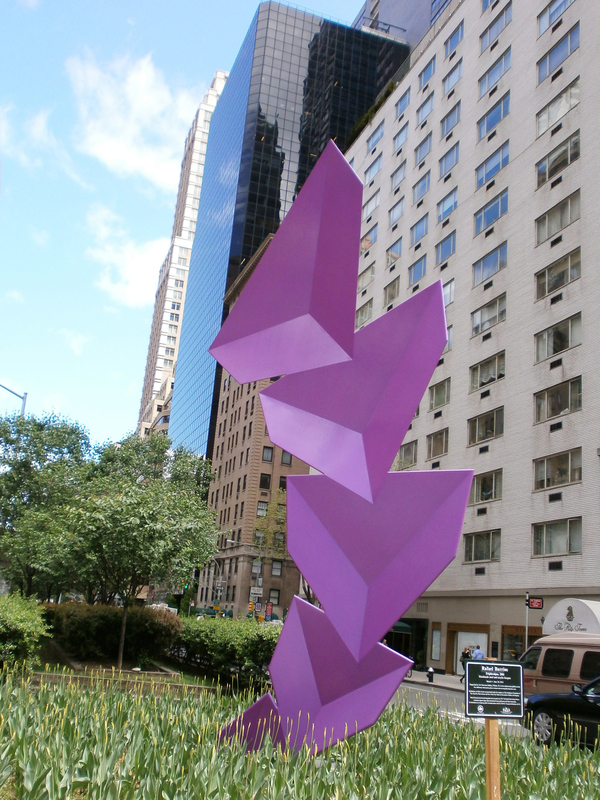 When you first see them, they look like three-dimensional geometric shapes, but as you crossed the street you realize that BAM! They’re pretty much flat. So cool. 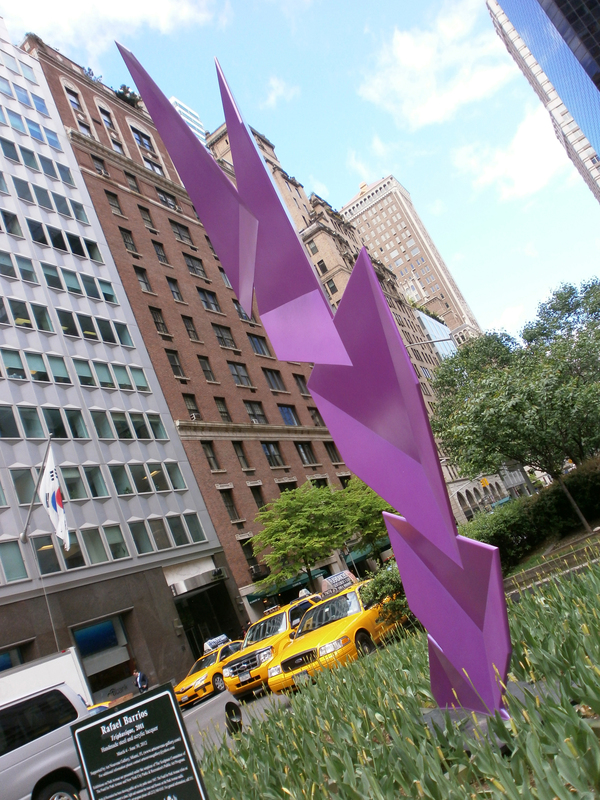 New York is able to have sculptures like that because the optical illusions rely on the perspective of the viewer. Since there’s heavy traffic (car and pedestrian) along and across Park Avenue, it works. Plus, they’re pretty. And New Yorkers generally like art. There are few wide medians like these that don’t have a sculpture of some sort, and since they change every now and then, it’s always nice to just walk around the city. 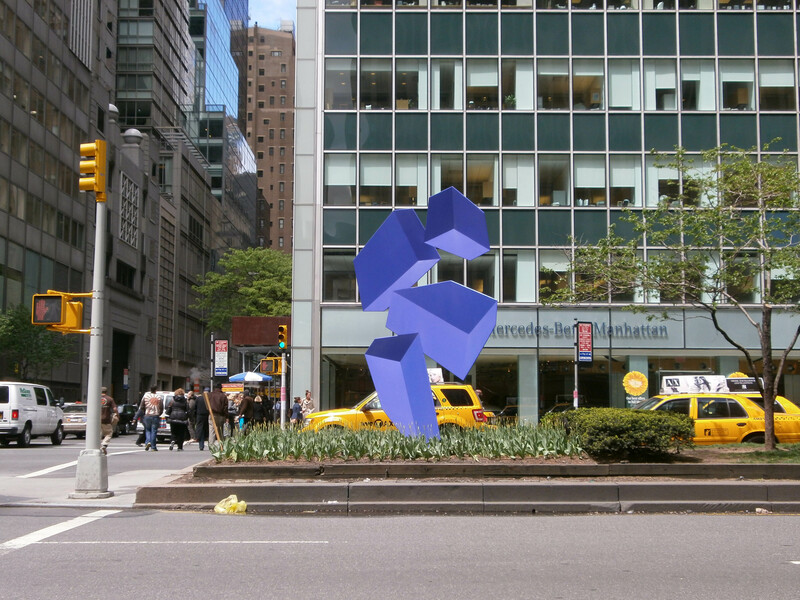 I couldn’t imagine the same series of sculptures working in a city like Houston. Unlike New York, Houston is so spread out and lacking density that most people probably wouldn’t even notice the sculptures since streets are so wide and cars just drive on by. 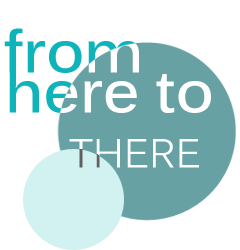 Anyway, this summer I have an internship lined up in the Museum District, so that’ll give me a chance to check out what this city has to offer in terms of the arts. I don’t think it could possibly compare to New York, but hey, few cities can. 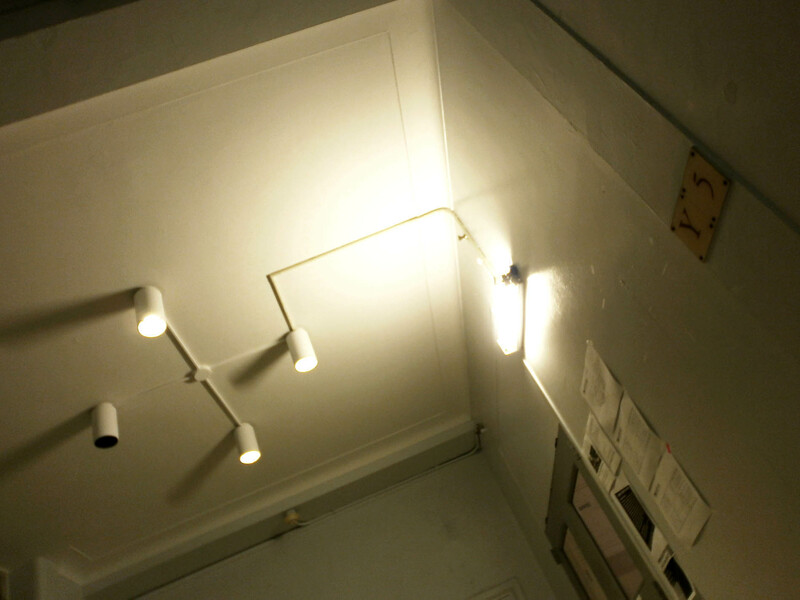 I have come to the conclusion that late nights in architecture studio is like a game of chicken. Who can last the longest? Who can endure the pain? You watch people pack up their laptops, wind up the long white charger cords, and tuck their headphones away in pockets. And internally, you smirk. Part of you envies them, as they wipe their eyes and stretch their arms and talk of going home and the softness of their beds that await them there. Yet as much as you truly envy them, you imagine them envying you more. As they pass by your work station, bags slung across weary shoulders and various empty soda cans and takeout containers in hand, they glance over at you. Their looks attempt to convey a sense of sympathy, but you interpret them as saying: “Ah! If only I could be that strong!” And at that point, despite the kink in your neck, the bleariness in your eyes, and the weight in your typing fingers, a sense of victory surges within you. For as the clock strikes three in the morning, you have won the game of studio chicken.